Free download Amazing Thief Rush – Escape for Android with APK file. Download Amazing Thief Rush – Escape new version from the direct link. Amazing Thief Rush is an epic arcade and crazy puzzle game about a super robber and crazy theif who outsmarts the law and enforcement department and succeeded to flee from the jail. He fooled the jail warden and successful able to flee from the prison. The police chief will sent more officers to arrest and catches this crook, but this smart criminal always makes a way to sneak out quietly like some trained ninja assassin or amazing thief. City billionaires are the corrupt thieves steal from them with your skills. The more robbery and stealing you make the more police will get mad and vigilant about you. Steal all the money from bank, house you get in the neighbourhood. A super cop is running after you and he want to handcuff you so he and send you back to prison lockup and balance injustice. Play as master mind burglar and escape from their hands. All thieves respect you as their king you plan grand theft mission from stealing billionaire in the city. Cops are on your chase steal all ornaments and cash you can get. Keep all your loot safe so other thieves can’t steal it from you. Smart puzzle game for little kids and youngsters even mommy and daddy can try this out.Play as cunning charming tiny thief and thug your wicked trickery keeps you life from peril. Rule the building roof, street don’t make noise be a champ runner in resident area. The police bulldog found your smell they are on your trail. 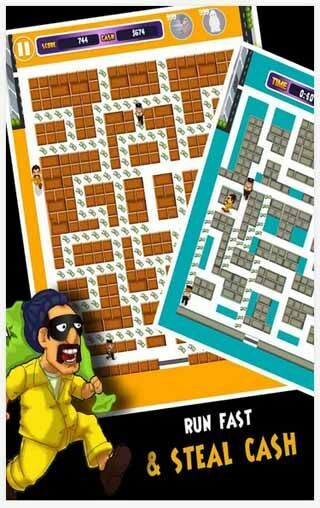 All boys and girls can enjoy this crazy theif escape fun game and challenge their family and friends for high score. Amazing thief was a decent guy once but not anymore now he is a famous gold thief. Just make a grand escape from theft scene. Use your super sneaky moves to escape police force or they will arrest you. New and superb game play different than any other runner games. 30 thrilling levels to steal maximum from the peoples. Cartoonish HD colourful graphics specially designed for young age kids and teens.